Once you know how to make your own flashcards and memory games, the possibilities are endless. 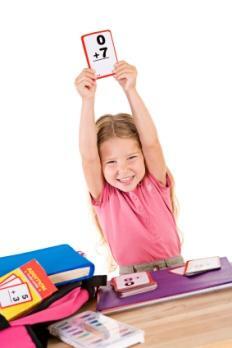 Flashcards are great for kids and adults, and memory games are wonderful teaching tools. After you decide to make your own flashcards and memory games, it's time to gather all of your material together. Creating flashcards and memory games includes deciding how you will present the material. For young people and adults, flash cards can simply be words on one side and definitions or answers on the other. In fact, flashcards aren't just for young children. They are often used as quick study guides for quizzes and tests. Memory games are generally used by the younger set, and they are often used to help develop children's concentration, observation, and comprehension skills. In addition, more advanced memory games are sometimes used to help measure intelligence in older kids and adults, and memory games sometimes play a vital role in measuring cognizance in the elderly. While you can certainly purchase flashcards and memory games at a variety of stores, they're also easy to make. In most cases, the simplest way to make flashcards is on index cards. Choose either the 3x5 or the 4x6 card size. While white cards are the most common, you can also purchase index cards in a variety of colors. Consider using colored cards with younger kids to make them more appealing. Design the cards with the audience in mind. For example, younger children who are just learning to read need to see neatly printed, large letters and words. If you are creating vocabulary flashcards, consider drawing a picture of the word or finding a picture online to cut and paste onto the card to help the child become familiar with the word. Flashcards make great study aids, so put an answer on one side and a question on the other. To make cards last longer, laminate them. Then, keep them together in a small card file storage bin. Remember-flashcards are great for a variety of review strategies. Whether you need flashcards for vocabulary review, pop quiz or test questions and answers, math concepts, or to teach a child how to alphabetize, they are easy and inexpensive to make. Memory games are often some of the first games that very young children play. The most common children's memory game is a simpler version of the popular game Concentration, and creating a memory game is very simple to do. If you are making a memory game for a child, you'll want to find brightly colored pictures that you either draw yourself, cut from magazines, or find on the Internet. Remember that you'll need to create matches of everything. While you don't have to have the exact picture, you do need to find matches that make sense. For example, if you want your child to find similar objects, then search for pairs of birds, types of animals, cars, etc. Even if you don't find two copies of the exact picture, you can find similar items and encourage your child to make the connection. This is a great way to help children make context connections with items that are similar but not exactly alike. You're now ready to make your memory cards. You can do this from card stock, construction paper, index cards, or even plain white paper. Glue your picture onto whatever backing you choose, but in order to make the cards last, laminate each one. If you plan on making cards out of sheets of paper, you can easily create identical sizes by folding the paper in half, then in quarters, and then in eighths. Once you unfold your paper, you are ready to cut out the cards and add your pictures. That's all there is to it! Once you make your own flashcards and memory games, you'll realize how easy and economical these activities are. Encourage your kids to help you design and create the flashcards and memory games as well so that the project becomes a family affair that everyone can enjoy!